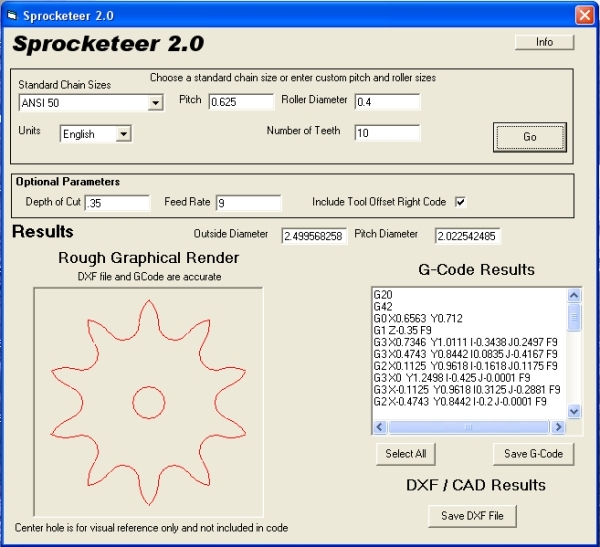 Sprocketeer is a program that I created to generate gcode for cnc mills to cut sprockets. It can also save the sprocket as a CAD (DXF) drawing. Sprocketeer in now available completely online. Click here to try the online version. Download: Download Sprocketeer version 2.0 zip file here. Instructions: Simply run the program and then either select one of the standard chain sizes from the drop down box or enter your own values for chain pitch and roller diameter. The only other required field is the number of teeth. The “depth of cut”, “feed rate” and “Include Tool Offset” settings are optional. 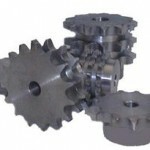 The gcode arc format and general formatting were created for use on a specific cnc mill, but should be fairly generic. After you have entered the required information press the Go button and the gcode and dxf code will be created. 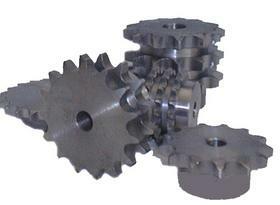 The finished outside sprocket diameter and pitch diameter are also displayed. To save your results for viewing or use simply click on the “Save as” button under the appropriate output section. Plea: I would like to develop this further and make it tool for everyone to use, but I need some testing and feedback. Please download Sprocketeer 2.0 and try it out. If you find any problems or have any suggestions or comments please email them to me at sprocketeer@idleamusements.com . Legal Speak: I give no warranty on this program or its use. If you tear something up using this I expect no blame in much the same way that I don’t expect any credit for its use.